Over the last 10 years, dark hardwood flooring has risen to the peaks of high demand. Dark hardwoods keep getting more and more popular. Most residential home owners are looking to go darker than what they currently have. There are only a handful of stain colors on the market that you can purchase to get a darker hardwood floor. It seems that the most popular is a blend of ebony and dark walnut, a blend of jacobean and ebony, or the newest – espresso. Each of these blends and colors will give your floors a dark brown tone with the grains being jet black. Espresso is a very rich color and looks extremely fancy, our most popular color of choice. Now, when it comes to staining hardwood floors – keep in mind, that the species of hardwood will absolutely change the overall outcome of the color. White oak is the best for getting the truest color. White oak has no pigment! White oak also has more character in the grains. With white oak, the 50/50 blend of each color will soak in great. Now, lets say that you’re the customer, and you want ebony stain color. With no extra work, that color will stain and blend great with white oak floors. Staining red oak hardwood flooring is a bit more challenging than white oak. Naturally, red oak hardwood has a pinkish/red tint throughout. And, believe it or not, something like 90% of residential hardwoods are red oak here in Kansas City. Therefore, our team has mastered staining red oak hardwood flooring. The first step is sampling the different blends. We always recommend water-popping the entire floor. Water-popping is a technique used in the hardwood refinishing industry to get a deeper and darker stain color. Basically, spraying the floor with water and that allows the grains to open up right before you stain the floor. Its a good technique for red oak flooring! As mentioned above, when selecting the ebony stain color. 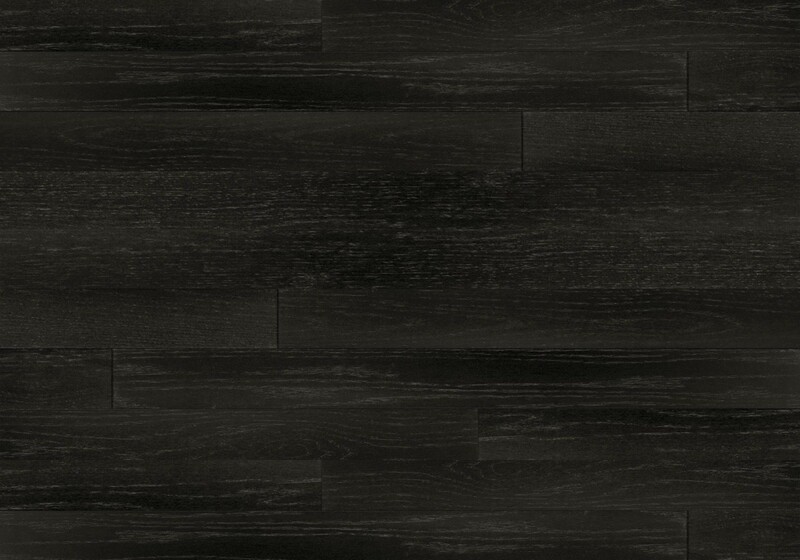 With red oak hardwoods, you would have to use a color called true black made by Duraseal. This stain color is much darker than ebony. However, when compared to staining white oak and red oak, side-by-side, its the exact same color. The only difference is simply the species and the stain color, but they look identical. This color completely knocks out the pinkish/red tint that is naturally in red oak flooring. If you use this color on white oak floors, it would almost cover up the grains. It’s that black! Takeaway: Use ebony stain color on white oak hardwood flooring. Use true black stain color on red oak hardwood flooring. Water pop the red oak hardwood flooring to get a deeper penetration of stain, this helps gets rid of the pinkish/red tint that is naturally in red oak floors.